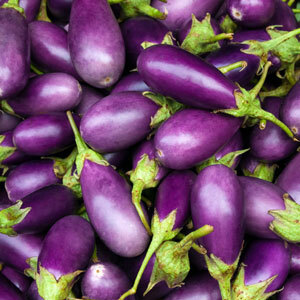 Classic Eggplant: This is the classic eggplant which is an oval, black-purple fruit. It can be baked, micro-waved or fried. Fairy Tale Eggplant: This is an eggplant that is as beautiful as it is delicious with very slender and long, neon-lavender fruit with bold streaks of white that are in clusters of two to four. Little Finger Eggplant: This is an eggplant that grows as an abundance of slim long, dark purple, 6 to 8 inch fruits. Little Fingers are unique because they can be picked when they are no longer than your little finger. If left to grow longer, the flavor and their sweet, mild taste are left unaffected. Twinkle Eggplant: This is a beautiful plum and white variegated fruit that has a fantastic flavor, firmness, and texture.